WEST -Guillaume Penn Traite avec les Indiens. Etablisant la Province de Pensilvanie dans l'Amerique Septenrionale en 1681. WEST, B. / LE ROUGE, L. - Guillaume Penn Traite avec les Indiens. Etablisant la Province de Pensilvanie dans l'Amerique Septenrionale en 1681. Guillaume Penn Traite avec les Indiens. Etablisant la Province de Pensilvanie dans l'Amerique Septenrionale en 1681. - WEST, B. / LE ROUGE, L.
Title : Guillaume Penn Traite avec les Indiens. Etablisant la Province de Pensilvanie dans l'Amerique Septenrionale en 1681..
Map maker : WEST, B. / LE ROUGE, L.. Size : 21.5 x 15.0 inches. / 54.5 x 38.0 cm. 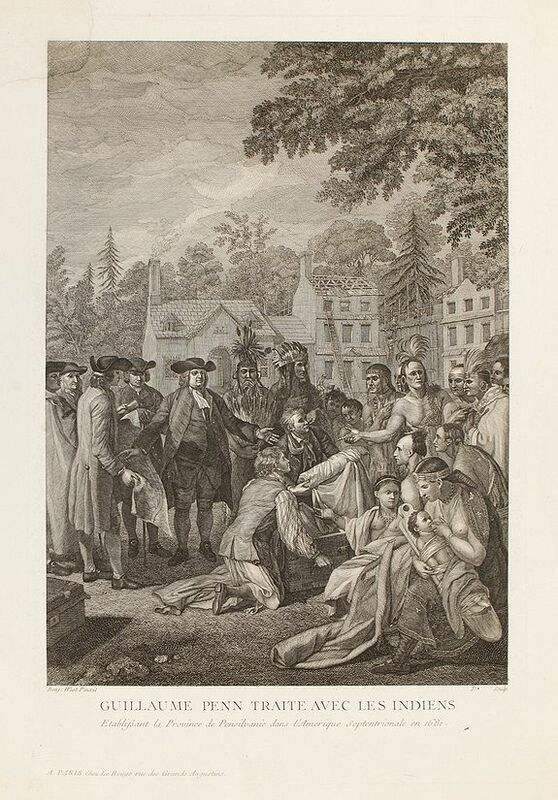 Description :George Louis le Rouge prepared an upright version of considerable size as the frontispiece of his atlas Pilote Américain Septentrional published in Paris in that year (1778). In doing so, he reversed the picture a second time, restoring it to the scene presented by West. Print commemorating the treaty between William Penn and his delegation and a Native American tribe in 1682 (Penn was granted a charter to establish the colony by the king of England in 1681, but did not actually arrive in North America until the following year). It is based on a painting commissioned from artist Benjamin West by Penn's son Thomas Penn in 1771, and is now in the collection of the Pennsylvania Academy of the Fine Arts in Philadelphia. West took artistic license by incorporating symbols of a promising future: imposing buildings are being constructed in the background, Penn's retinue trades goods with the tribe, and a Native American woman breastfeeds her baby, probably intended as an allegory of peace and plenty. Within a few years, the painting was made into a popular edition of prints in London, engraved by John Hall. In France, Robert Delaunay produced his own version as the frontispiece to his Atlas Ameriquain Septentrionale. Delaunay changed the proportions of the image to fit the book's format. The story of the circumstances surrounding the creation of the West painting and subsequent prints is told on the State Museum of Pennsylvania web site. Benjamin West was the first American artist to receive international recognition and influence artistic trends in Europe. He was born in Pennsylvania and studied art in Philadelphia. There he met a sponsor who sent him to Italy to study classical art. He settled in London in 1763, making his reputation as a history painter, and receiving the prestigious appointment of historical painter to the court by King George III in 1772. Twenty years later he became president of the Royal Academy of Arts. Robert Delaunay was a French printmaker. Condition : The missing top left corner has been replaced by an added piece. Otherwise in very good condition.